Green Zone is the latest exercise in shaky cinematography from Paul Greengrass, one of my favorite directors today. Greengrass is one of the few filmmakers who can dramatize political issues using a pop culture style (somewhat like Charles Dickens). He starts a movie, grabs you by the throat and won’t let go, using racial unrest and government cover up (The Murder of Stephan Lawrence); the conflict in Ireland (Bloody Sunday); terrorism (United 93); and intelligence corruption (the Bourne movies) as his bailiwick. Green Zone is true to form as it is a fictionalized (to say the least) look at how the U.S. got into the war in Iraq and then got hoisted by its own petard. But in the end, though the movie is entertaining enough and I was never bored, it never really satisfied. This may be because as visual a stylist as Greengrass is, Green Zone may actually demonstrate the downside of considering movies mainly a visual art form. Having a visual style and an ability to tell a story in visual terms is fine, but it can only do so much when it comes to characterizations and creating interesting and exciting plot twists and turns. One way to demonstrate this is by comparing Green Zone to In the Loop, also a political diatribe, but with a black comedy approach. In the Loop is about the petty conflicts and furious wrangling leading up to America and Great Britain’s entry into the Iraq war. But it has the same conceit as Green Zone: in In the Loop, just as one comes to think that maybe, just maybe, a war with Iraq can be avoided, we realize that, no, it can’t, because in real life, we went to war with Iraq. 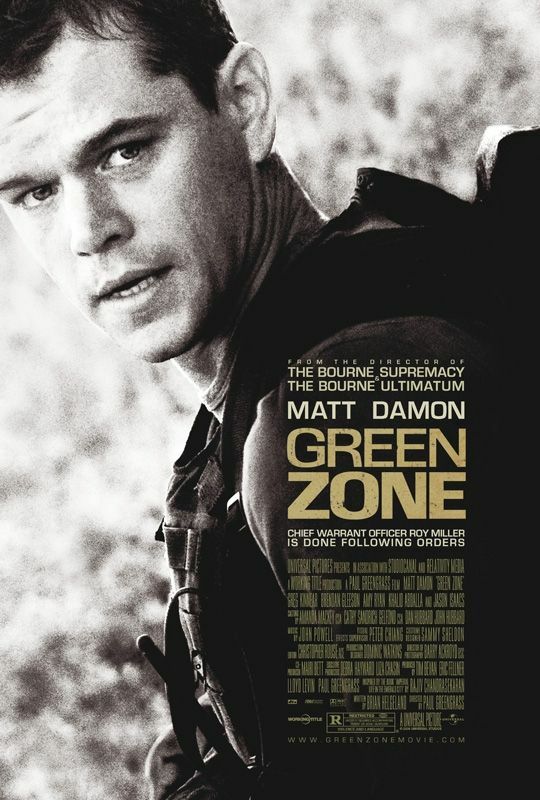 In Green Zone, it’s about the search for WMD’s and the truth behind an intelligence source and the idea that if only the truth could be revealed in time, the future of Iraq could be different; and as In the Loop, the audience for Green Zone already knows the truth, they know that the there were no WMD’s and the intelligence source was fabricated and that the “good guys” lost. But while In the Loop grabs us emotionally even though we know the outcome, Green Zone leaves us a bit hungry and unsatisfied. And the reason seems to be that while Green Zone is beautifully directed, the screenplay by Brian Helgeland has characters that are bland and not that interesting and the plot is filled with twists and turns that lack surprise (with an ending that is just a bit too pat to work). In contrast, while In the Loop has the somewhat bland look of a TV show (which it is based on), the characterizations and dialog are so brilliant and the constant farce inherent in the twists and turns so surprising, we can’t help but become emotionally involved and even devastated when the truth, something we already knew, is revealed. The movie stars the square jawed Matt Dillon as the hero; Greg Kinnear as the oily bad guy; and Brendan Gleeson (struggling with an American accent) as the intelligence officer not intelligent enough to outthink Greg Kinnear (not something one would want to put on one’s resume). They’re all fine, but can’t do much with what they’re given. The Ghost Writer is the latest film from Roman Polanski, also a political thriller, but a bit less frenetic; in fact, it’s as soothing as a Budhist retreat in comparison. 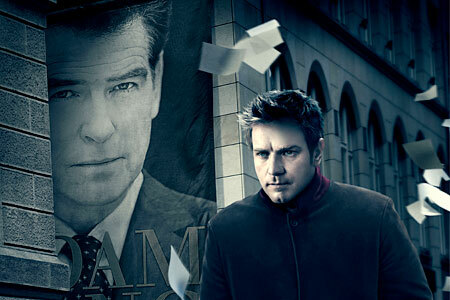 In it Ewan McGregor plays a down on his luck author hired to ghost a former British Prime Minister’s (Pierce Brosnan) memoirs after the previous writer (a long time assistant and faithful friend to the PM) is found dead from drowning, an apparent suicide. The basic premise of this story, that the PM’s wife is a CIA operative who actually pulled the strings of her husband’s actions, might have worked well as a dark comedy on the level of Dr. Strangelove and The Loved One, but as a drama, it’s a bit hard to take seriously. The screenplay, by Robert Harris and Polanksi himself, never makes the whole back story believable, though they do provide some of the drollest lines in movies of late. The movie itself, though it has its pleasures, starts out a bit slow (possibly because McGregor never solves the mystery so much as stumbles onto various clues, each discovery of which takes a lot of setting up). It’s not until McGregor drives his predecessor’s car and the GPS leads him to Tom Wilkinson, a slithery professor who claims not to have known the PM and doing such a convincing job of it that one knows he’s lying, that the pace picks up. Wilkinson and especially Brosnan, showing what his career could have become if it hadn’t been sideswiped by Remington Steele and James Bond, give the best performances in the movie. Everyone else gets the job done, though Kim Cattrall doesn’t have the most convincing of English accents (Wilkinson doesn’t have the most convincing of American, but he manages to rise above it). The ending never quite made sense to me. It wasn’t clear who put the code in the book (was it the previous ghost writer or the PM, either choice of which comes equipped with their own set of holes in the plot) and it has one of these codas where the hero has a choice: call the media and the PM’s political opponents and tell them the truth, or reveal it to the one person who can have you killed. Guess which one he chooses? And then he gets killed in a way that can’t guarantee a person would be killed (hit and runs, though visually shocking, aren’t as certain in their results as this movie would have you believe). The movie looks good, with its bleak, film noir cinematography of grays, and the effective music by Alexandre Dusplat adds to the tension, but the story never really works. There’s also an odd subtext to the film. The British, at least in such films and TV programs as Love, Actually, The State Within and The Girl in the Cafe, have often held themselves up as the moral arbiter of the world, a righteous country often checking the U.S.’s rash political policies. Here, the idea is taken one step further: maybe England didn’t take the high road in the war on terrorism, but it wasn’t their fault; the PM’s office was just an extension of the America CIA. This might be a frightening idea if the British hadn’t chosen an organization to blame that couldn’t even kill Castro when it wanted to. IT’S A MAD, MAD, MAD, MAD, MAD, MAD WORLD: Reviews of Alice in Wonderland and Mother.